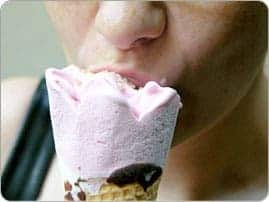 Eating tons of ice cream won't help your brain get any bigger, though. Sorry! A new Oxford University study shows how people living further away from the equator have bigger eyes and brains than those living closer to it. This is to cope with the harsh colder climate, scientists say. Anthropologists come to this conclusion after examining 55 skulls, dating from the 1800s, representing 12 different populations from around the globe. By measuring eye sockets and brain volumes, the researchers were able to make a comparison based on the latitude in which the sockets were collected. As such people living further north, like native-Scandinavian dwellers have bigger eyes and brains than, for say, those living in Micronesia, located just north of the equator, who actually had the smallest score. This doesn’t necessarily mean vikings are smarter, though. Scientists say these modifications came as a result of the colder climate, which forced these populace to grow a larger portion of the brain devoted to vision, due to low light conditions caused by cloudy skies and long winters in northern territories. Related, scientists have long saw a correlation between eye size and increased/improved nocturnal activity. It’s well known that birds with somewhat over-sized eyes are the first to sing at down, or that certain primates with big eyes are a lot more comfortable during the night than their cousins.